Home / nebosh diploma / nebosh international diploma / nebosh nebosh diploma / neboshidip / safety career support / Which Should You Study : NEBOSH International Diploma or NEBOSH National Diploma? ? ? 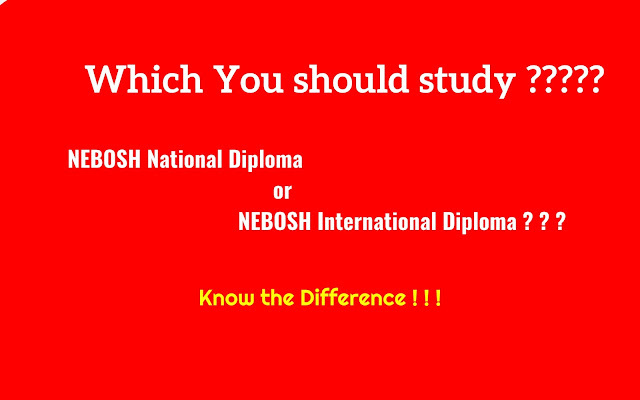 Every successful safety practitioner wants to enhance their career with international safety courses, recently I heard the doubt from my colleagues"What is the difference between NEBOSH National Diploma Vs NEBOSH International Diploma" and which one is best for me? If you are a professional with the confusion to choose this Nebosh Diploma course after completion of NEBOSH IGC this blog is made for you. The Major and key differences between Nebosh National diploma and Nebosh international diploma are the applicability of legal Requirements. The Syllabus and examinations are framed based on the regulations in U.K and will be most valuable when you are looking to start your career in European countries. The Syllabus of NEBOSH International Diploma is formed based on the International conventions and recommendations and their core requirements relate to health and safety. The Regulation which Requires the employer to provide the safe workplace , safe equipment , safe system of work to eliminate or control the hazards in the workplace. In U.K - Health and Safety at work Act 1974. In ILO - Occupational Safety and Health Convention, 1981 (No. 155). Hint : Most of the times the requirements will be same , but the name of regulations will differ. The Choice of NEBOSH National Diploma and NEBOSH International Diploma is purely depends on the country in which you are looking for a career. Great Article !! Above mentioned plans are quite useful. Thanks! You can also Subscribe / Bookmark the Blog to Get all the Posts into your Inbox. Valueable information, request to keep updating all the relevant information.